Natural menopause symptom relief plus sleep improvement formula. 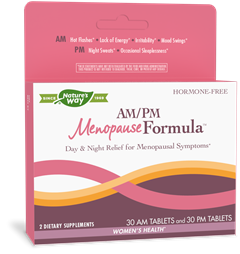 Why use AM/PM Menopause Formula™? AM: Take 1 (white) AM tablet in the morning. PM: Take 1 (purple) PM tablet approximately 30-45 minutes before bedtime. It may take four to five weeks to achieve full benefits. Continue use to maintain benefits. Do not use if pregnant, nursing, or by children under 18 years of age. Do not use if sensitive to caffeine. Each serving of the AM Formula contains 50 mg of caffeine. Discontinue use and consult a healthcare professional if you have a liver disorder or develop symptoms of liver trouble, such as abdominal pain, dark urine, or jaundice. Avoid alcohol and do not drive or operate machinery while taking this product. If taking medications for diabetes, sedatives, tranquilizers, or any other medications, consult a healthcare professional before use. Suntheanine® and Sunphenon® are registered trademarks of Taiyo International, Inc.